ILARCO built a few quad-mounted American 180s. 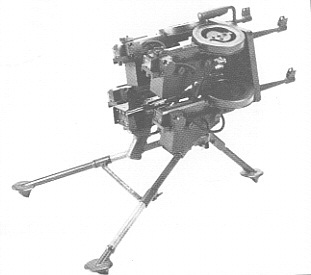 These "Quad 22s" fired from a tripod at a truely devastating rate of over 6000+ rounds per minute. An American 180 salesman from the New England area mounted a pair of quad American 180s on a Falcon ultralight airplane. The "Quad 22s" were placed in removable brackets of the left and right sides of the fuselage. The salesman was hoping for sales to third world governments. The individual guns could be fired in any combination. They could be fired one at a time, or one on the left and one of the right, or all eight at once. Using 275 round drums and firing the guns singly produced eighty-eight seconds of fire. In most cases, all eight American 180s would be fired at once to minimize return fire from the ground. This translates into over 12,000+ rounds per minute!